Released in the early 1980s, Eau de Monsieur1 was one of Annick Goutal's first perfumes. I was surprised to see Eau de Monsieur listed on the Annick Goutal website with a release date of...2013. Had it been reformulated in a BIG way? Was it a new perfume altogether? Did a content editor make a mistake? Eau de Monsieur disappeared from the Annick Goutal line-up a long time ago (the 90s?) and has been recomposed by Camille Goutal with perfumer Isabelle Doyen. I have a vintage bottle of Eau de Monsieur and I wear it sparingly, on days when I feel happy or nostalgic for California (where I first wore it). Putting on vintage Eau de Monsieur is like being touched by sunshine when you yearn for warmth. Vintage Eau de Monsieur is pungent with wonderful liquor-y citrus fruit and immortelle aromas — each with a hint of saltiness. As the perfume wears down I smell dry woods (with some patchouli and vetiver?) and soft/crumbly moss. I'm addicted to vintage Eau de Monsieur; it smells great all day (and one spritz is all you need). Wearing the current version of Eau de Monsieur (next to the vintage) is a let-down. Everything about present-day Eau de Monsieur is lighter (weaker) than vintage. "New" Eau de Monsieur presents cologne-ish citrus (much sheerer than vintage Eau de Monsieur's fruits). The light citrus mingles with furry geranium leaf and a bit of mint. Eau de Monsieur is now minimalist...a quiet and faded take on its progenitor. 2013 Eau de Monsieur smells good (and it's sold at a good price) but it (literally) pales next to the vintage version; even when applied generously, it disappears quickly on skin. I noticed while wearing the two versions of Eau de Monsieur how the original formula was perhaps a pathway to Annick Goutal's Sables (1985) and current Eau de Monsieur backtracks to Eau d'Hadrien (1981) and 1995's Eau du Sud (but without the gorgeous and abundant natural citrus notes those perfumes possessed when first released). 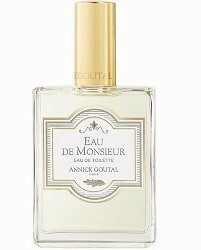 Annick Goutal, the woman, was a genius at conjuring emotions and places with the perfumes that bore her name. I wonder how she'd react to the tamer Annick Goutal (the company) that exists today. Annick Goutal Eau de Monsieur is available in 50 ml ($65) or 100 ml ($149). 1. Listed notes for today's version of Eau de Monsieur are mandarin, bergamot, mint, rose geranium, patchouli and sandalwood. I was afraid of this, and I so agree on the original Eau de Monsieur. Fortunately for me I have enough to last me a lifetime. It’s a shame that Goutal has seemed to change course recently. True they did some tamer scents earlier on, but those were still quirky, and Fier, Sables, Passion and the late great Vétiver can hardly be called tame. It used to be one of my favourite houses, but have not been really tempted by their offerings recently. austenfan…agree…enjoyed Les Orientalistes and Eau de Fier. I also feel less than wanting with the more current releases from Goutal. AG is such a magnificent house that has always had such a tremendous combination of focus and creativity, seemingly outside of the constraints of the penny-pinchers. I think it is the horrible IFRA rules that has put Goutal in a bad spot for creativity. I treasure my vast collection of older Goutals. The original Eau de Monsieur is probably the only fragrance left that I truly covet anymore. It is just so perfectly gorgeous, and really wears as a proper fragrance, not just an edc. I am very lucky to have a small decant of it, and I think, Kevin, that you are right it was the launching point for Sables. That touch of immortelle in EdM is what really makes it different from other edc. I consider myself very lucky to have original bottles of Duel, Eau de Hadrien and Eau de Sud which I love very much. I am very interesting in smelling the newer Eau de Monsieur, but I’ve already persuaded myself it is a different fragrance so I won’t be let down. I’ve also noticed from some research that they’ve redone Eau de Ciel too. AnnS, my vintage bottle of Eau de Monsieur is running low…I am preparing for the inevitable farewell. I won’t replace it with the new version. That is very sad indeed. When you are finished with it, we’ll have to have a proper ceremony good-bye. AnnS…ha! I usually hang on to the bottle for a sniff every now and then…but when the scent is completely gone I toss. That’s so sad and a real loss for some of us who have come too late to the niche and indie perfume lines. You must feel as if you are losing a deep and abiding friendship when formulas are changed so drastically. Deva…sometimes I feel grateful that there’s an approximation of a scent…but I don’t think I’ve ever bought one! My heart skipped a beat when I saw a bottle of Eau de Monsieur on an online retailer’s website a year ago. It took another heartbeat for my enthusiasm to dissolve, blancmange-like, for I’d realised that it was not the right bottle or the right notes. EdM is a beautiful, evocative scent whose demise not even Sables has managed to make up for. Dusan…agree! There’s nothing like it. I never tried Eau de Monsieur, but I treasure my other older Annick Goutals, such as Passion and Heure Exquise, so I feel your pain. I hope you find something new and wonderful soon! Noz: I second your wish! For us both. MrsD; yep, leave the vintage alone! Ha! Have mentioned on here before (many times but not for a while!) my disappointment at the discontinuation of Eau de Camille (my all time favourite) & Eau de Ciel – Robin did let me know Camille was available by special order, which I did investigate further, but it is prohibitively expensive & I couldn’t find out if it was still the original formulation. I would hate to fork out for it & then be disappointed. The reformulated Ciel does nothing for me. I’ve mentioned on here before that many years ago when AG was launched in the US I was travelling a couple of times a year to various major US cities – & in the more upmarket department stores (Nordstrom, Nieman Marcus & Saks Fifth Avenue if memory serves) there was a ‘buy one get one free’ offer – I couldn’t believe my luck! The freebies on offer did not comprise the whole range, but Hadrien was one of them so a lucky friend was given a bottle on more than one occasion. Carolyn, AG was very generous with freebies and gifts with purchase. Indeed they were, Kevin, as were Miller Harris in their original, sadly no longer there, shop in Needham Road, Notting Hill.